Forced out of Thessalonica by the Jews for his effective ministry, Paul wrote to encourage and teach the new believers there. 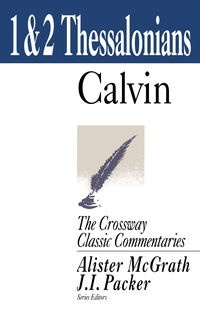 Within his first letter, according to John Calvin, is a brief definition of true Christianity. It is a faith that is full of vigor, employing itself in the labors of love, intent upon the hope of the manifestation of Christ, despising everything else, and armed with an endurance that rises above the wearisomeness of time and worldly temptations. Paul’s second epistle then expands upon and clarifies some of his teachings from the first letter. John Calvin delves into the rich meaning of Paul’s encouraging words, bringing insight into the historical church, as well as instructing today’s pastors on maintaining a healthy church and inspiring believers to grow in their daily walk.